It's been awhile - lots of personal problems have kept me less than conversational lately. I do have some things to share, though. The Harry Potter Knitting and Crochet House Cup has been alot of fun so far. I have been recruited as beater for the quiddich team. That means that I was asked to spin some yarn for a whole-house project. I'm spinning some baby camel down - it will be trim on a hood for a little girl. The camel is so soft and fluffy - I had to chase my little girl out of it last night before she got too attached. I'm planning to ply it with some bronze thread to make it sparkle and be more Ravenclaw-y. My first homework assignment was for astronomy class- make something star related. 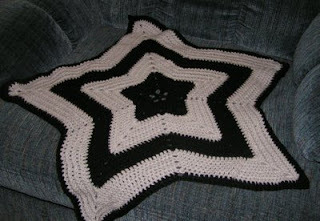 I crocheted a star lap blanket. I did have to modify my color choice, though, to black and gray because blue and gray just screams Dallas Cowboys and I really don't want that. For transfiguration we were asked to pick a project that was something we hadn't done before. 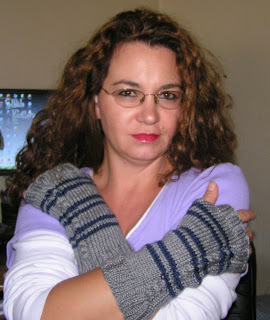 I already had a pattern that I wanted to do that had three new things - cables, stripes, and thumb gussets. I did go with the blue and gray for this, though, so it will match some other things that I have planned. I also learned how to make a reverse-image right/left pair, too. Yay,me! Now, I'm sure you're wondering why there's a picture of me and not just the gloves. Well, some of you haven't seen me in awhile. Some of you have never seen me. It's not a great picture - pardon the kind of double chin effect - but here I am. Besides, I really like my new hair - shorter and darker than it's been in awhile. For anyone interested, it's time to be signing up for fall sock clubs. I'm in the winter edition of the Knitting up a Storm yarn club. It's based on movies this time. First up is Harry Potter and the Prisoner of Azkaban. Woo hoo! I'm really excited to see what Anna does for the colorway. The summer book skeins are all so pretty and match really well. Of course I'll be making something in honor of my man Sirius. Speaking of men, I found Josh Bernstein's new show last night on accident. I've missed him. He makes me want to rush out on adventures...well, I'll leave that there. heh. It's the first shipment for the Wollmeise sock club! It came today. I'm so loving the purple skein - it's called Elder Bush. It's so rich and wonderful. I think it will be a scarf or shawl or top or something that can be seen. The green is called Box Wreath. I'm not into green but it's pretty. I hope I don't get in trouble for showing a picture - in ravelry we're supposed to use a spoiler picture in our stash. So don't tell on me! That's all for now, I guess. I'll go back to reading Harry Potter and the Deathly Hallows now - I'm almost at the really good part! I love that start blanket! I was thinking how that also would make a cool rug! Sweet gloves too! Even if its not that cold out yet, they would make great reading gloves!